As I hinted on Saturday, the IP Engineering wooden train set is back. It's sat in a box for over a year, but now I need more pretty 32mm gauge rolling stock for my "Build a layout" project at Peterborough, so out it has come. The main stumbling block has been painting. 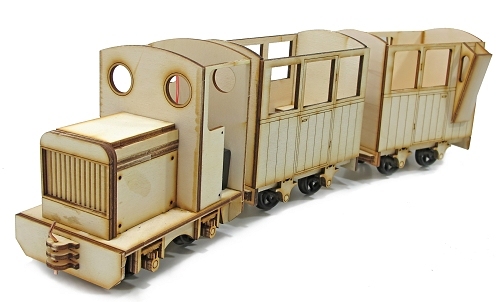 I was worried that I'd hide all the laser-cut detail when I slapped on the paint, but as I discovered with the same companies railcar, washes of thin, cheap acrylic work a treat. I kids myself a little that this looks a bit like the Ramsey Peir tain. It doesn't, but that's the vibe I plan to channel when I finish it. That and a hint of fairground or park railway.